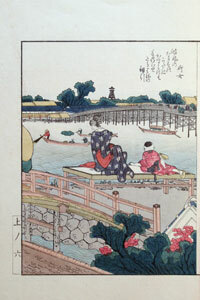 In print 1-11 a woman and a boy are staring at Sumida river, with Shin Ōhashi bridge, built in 1693 and about 200 meters long, visible in the distance on the right. 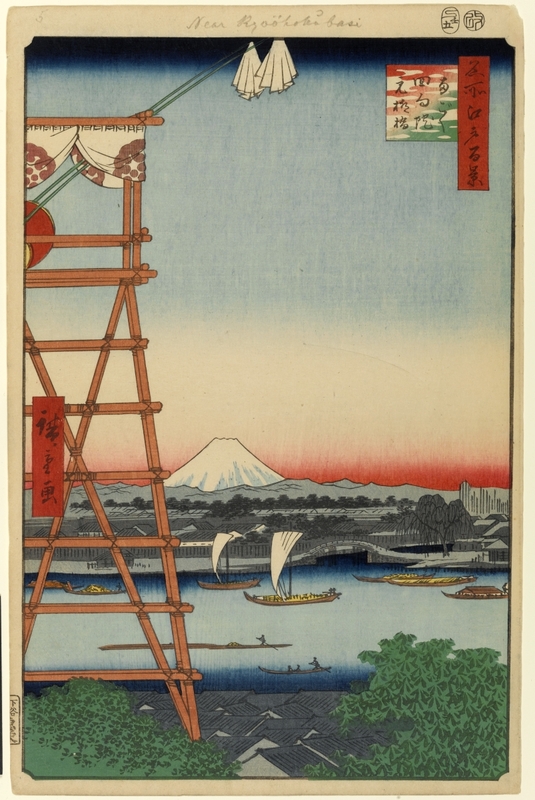 On the far bank we also see one of the fire watchtowers that were built in Edo after the great fire of Meireki in 1657. 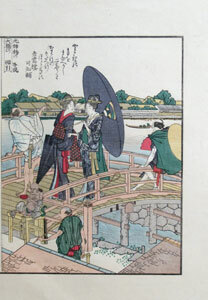 In the foreground, town dwellers cross Moto Yanagibashi (元柳橋, i.e., Old Willow bridge) where a arhat (one who has attained enlightenment) is begging. Both comic poems on these prints refer to the Nakazu pleasure quarter that was destroyed some eleven years earlier, see prints 1-7 and 1-8 for details. In Japan the cuckoo or hototogisu mentioned in the title of print 1-12 is associated with the coming of the summer months. Unlike Hokusai - whose views were all taken from the west bank of Sumida river - this map is based on a view taken from its east bank. 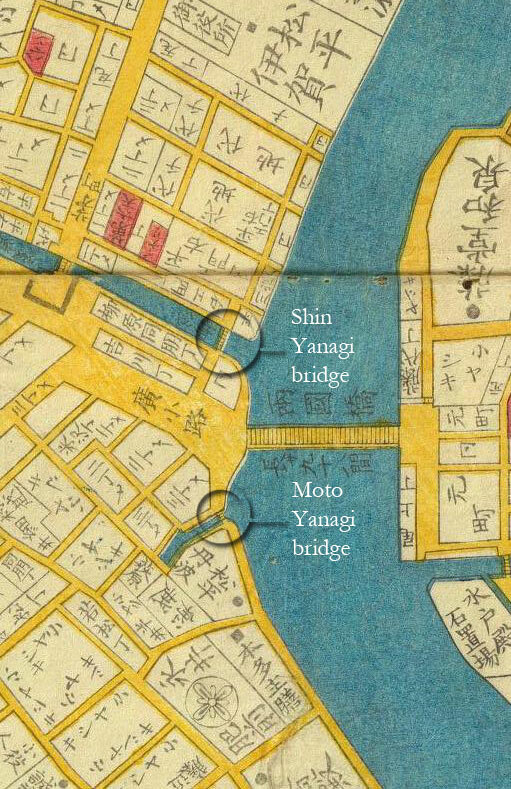 The large bridge visible at the top is Shin Ōhashi bridge; the large and crowded bridge shown at the bottom is Ryōgoku bridge. 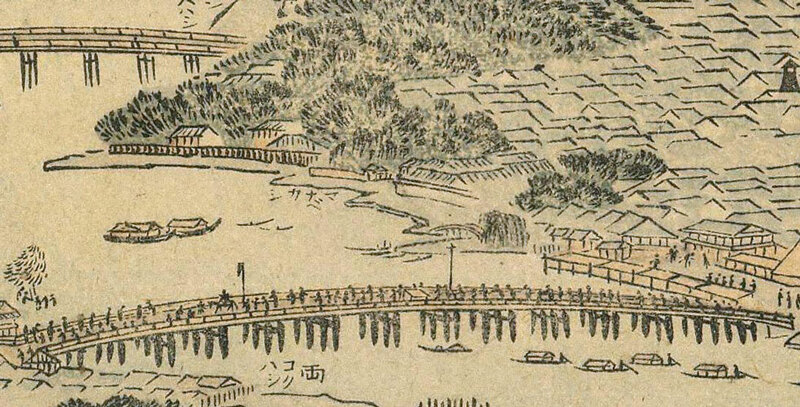 Just above and slightly to the right of the middle of Ryōgoku bridge Moto Yanagi bridge can be detected, together with the willow tree on its right from which it derived its name. 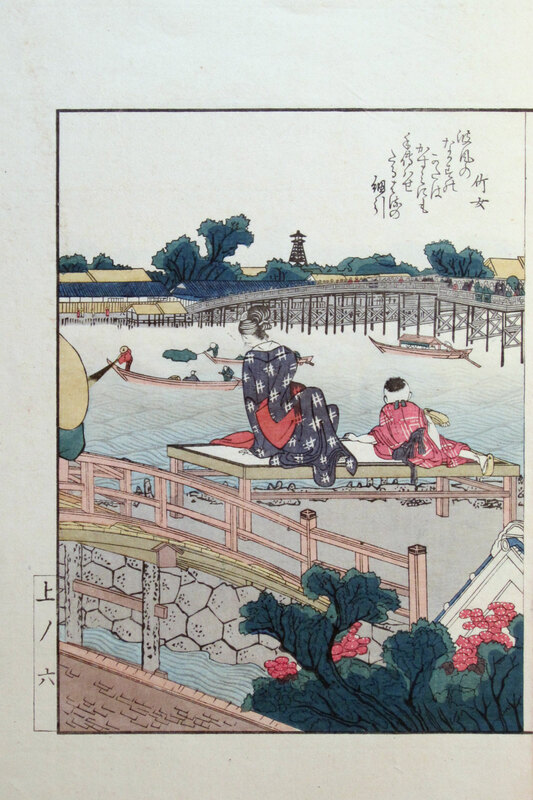 To the right of the willow tree the stalls in the main street of Hirokōji are visible as displayed in prints 1-13 and 1-14 and in prints 1-15 and 1-16. 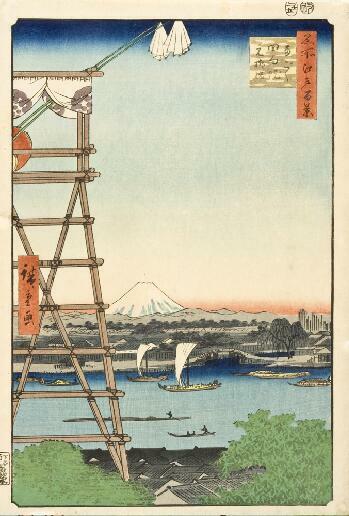 Again, this design of Utagawa Hiroshige is based on a view from the east bank of the Sumida river. As the title of the print indicates, it provides a clear view of Old Willow bridge, as well as of the willow tree after which it was named. This map detail both shows the location of Moto Yanagi bridge on the west bank south of Ryōgoku bridge, and the location of Shin Yanagi bridge on the west bank north of Ryōgoku bridge. This also explains the name ‘‘Old Willow’’ bridge (as opposed to plain ‘‘Willow’’ bridge): a new Willow bridge was later built over the mouth of the Kanda river just north of Ryōgoku bridge.